Aluminium production starts with the raw material bauxite. Bauxite is a mineral found mostly in a belt around the equator. Bauxite, containing 15 to 25% aluminium, is the only ore that is used for commercial extraction of aluminium today. Global estimated bauxite resources are estimated to be 55 to 75 billion tons and at the current rate of extraction, these reserves will last 250 to 340 years. The majority of the global bauxite reserves can be found in Australia and Africa. Aluminium oxide (alumina) is extracted from bauxite in a refinery. Alumina is then used to produce primary aluminium. The production of primary aluminium takes place in large production lines. In the smeltering process alumina is refined into aluminium. The aluminium atom in alumina is bonded to oxygen. These bonds have to be broken by electrolysis to produce aluminium metal. Alumina is transported into pots (large container and is dissolved in an electrolytic bath. Liquid aluminium is drawn from the cells using specialised vehicles and is cast into ingots and billets for further processing. Aluminium is a global commodity traded on the London Metal Exchange (LME). The price moves according to global supply and demand. Primary aluminium is alloyed with other elements such as copper, manganese and silicon for additional strength, corrosion resistance and other properties. These are then cast into billets, remelt ingots, slabs, and rods and other castings for further processing. These log-shaped castings are produced in various diameters and lengths using a vertical direct chill process. They are used for producing extrusions, also known as profiles, that find major end use in construction, industrial and transportation purposes, as well as for forging purposes in automotive industries. These cuboid shaped ingots are the input to the rolling process and are produced using a similar technique to billet. Slab is used to produce rolled aluminium products. Aluminium can be extruded and shaped into a variety of tubes and profiles. Aluminium billets are heated to 500 degrees Celsius and pressed through shaping tools, to make profiles and various products. Aluminium can be processed in a cold and hot condition. Aluminium is a ductile. It can be rolled from 60 cm to 2 mm to 6 mm. Final foil products can be as thin as 0,006 mm and still be completely impermeable to light, aroma or taste. The metal itself forms a protective oxide coating and is highly corrosion resistant. Various types of surface treatment can further improve these properties. The properties of aluminium change when small quantities of other metals are added to produce aluminium alloys. These can give greater strength, brilliance, corrosion resistance and ductility, all depending on what the metal is to be used for. And they can make aluminium easier to form into an endless variety of products. Aluminium fabricated products are used throughout the world and throughout many different sectors. In developed countries the demand for aluminium comes mostly from the rapid growing transport industry, which is driven by an expanding auto market. 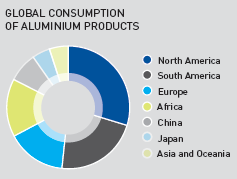 Mature countries traditionally use more aluminium in the light vehicles production. Due to the lightness, aluminium makes cars more energy efficient. Developing countries are expanding their food and infrastructure to satisfy the needs of a growing population, migrating to large cities. Therefore, the packaging and construction sector represents the biggest consumer of aluminium across developing countries. Aluminium is one of the most environmentally friendly metals in terms of how it is produced and applied. It can be easily recycled, whilst keeping its distinctive properties. 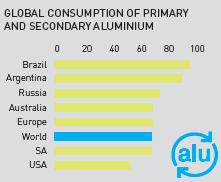 Aluminium can be endlessly recycled without loss in quality (secondary aluminium production). Only 5% of the energy required to produce primary aluminium is needed to remelt aluminium for new uses (secondary aluminium production). The world’s stock of aluminium in use is like a resource bank. Around 75% of aluminium ever produced is still in use, and some of it has been through countless recycle loops.